Incroyable... mais vrai! On devrait redemarrer cette emission et la consacrer a la FSSPX! A couple days ago, I sent you a news report regarding a June 27 Tweet from Fr. Kevin Kusick, in which he referenced a SSPX priest going on a vocation retreat to the Military Archdiocese. In that article, I elaborated on the implications and significance of an SSPX priest joining the Military Archdiocese (i.e., bi-ritualism, etc). Towards the end of that article, I held out the possibility that this incredible development could be nullified if it turned out this priest was actually leaving the SSPX for the conciliar Church. This morning I received an email response from Archbishop Broglio himself, which seems to confirm this very thing (see below). Regrettable as it is to see priests defecting from Tradition for the conciliar church, it is a much better outcome than what would have been implied had this priest planned to remain within the SSPX. 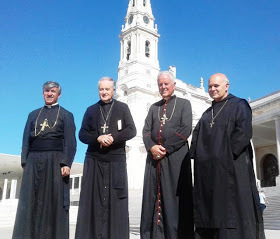 If this priest has in fact determined to join the conciliar church, as the Archbishop seems to say, then there really is no fault here on the part of the SSPX, even for this priest's attendance at a conciliar retreat (i.e., If he is going to leave, the District is really powerless to forbid him; he can just pack his bags and go). It might have been nice had the District clarified the matter once the Military Archdiocese's press release made the matter public, but in any case, it would seem this matter cannot be chalked up to the SSPX's ralliement with unconverted Rome. Father Cannon referred your message to me. First of all, your characterization of my statement about priests of the two societies in communion with the Holy See and chaplaincy is simply incorrect [This statement is in response to a statement Archbishop Broglio was cited as having made in a "1 Peter 5 Blog" article, in which the Archbishop is reported to have said, "I would rather have no priests at all then traditional priests -SJ]. My statement was that priests in the military must be able to be all things to all people and consequently must be able and willing to celebrate the Mass according to the Third Edition of the Roman Missal. I missed the detail that the press released contained the names of the dioceses or religious communities of the participants. Normally that information would not be published. I regret my error. It is unclear to me why you need the clarifications you requested. Finally, the priest in question desires full communion with the Catholic Church. I have helped many men and some families on that journey and I do not intend to stop now.